Gov. 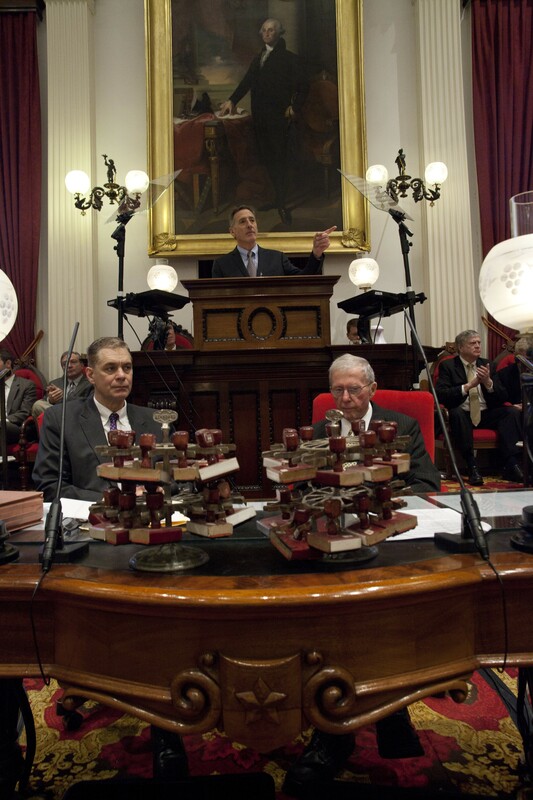 Peter Shumlin delivers his fifth budget address. Calling it “the toughest budget I’ve put together,” Gov. 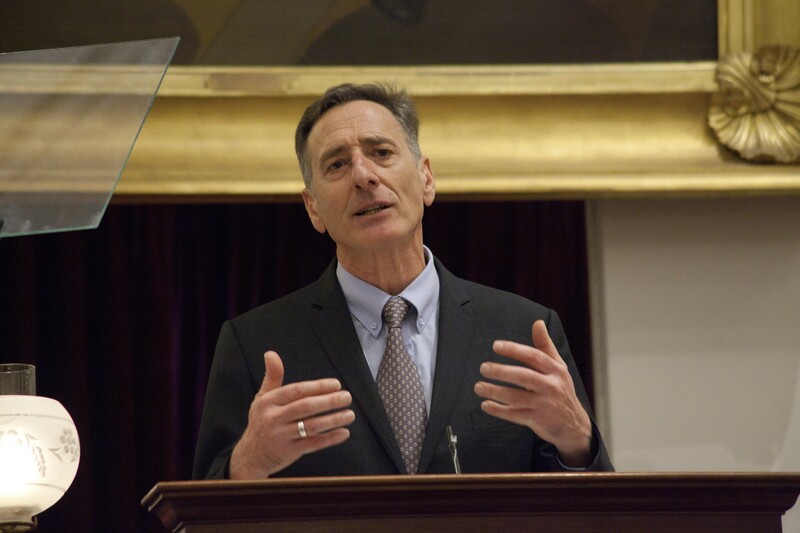 Peter Shumlin on Thursday called for a mix of spending cuts and tax increases to close a projected $94 million gap in next year’s general fund. In an unusually long, hour-and-twelve-minute budget address, the third-term Democrat challenged lawmakers assembled in the House chamber to balance the state's books without relying too heavily on tax hikes. But just moments later, Shumlin proposed a significant new payroll tax on employers in order to increase Medicaid payments to providers and drive down the cost of health insurance premiums. Shumlin’s proposed $5.66 billion budget includes $1.47 billion in general fund spending. That represents a 4.4 percent increase over the current budget, assuming a package of mid-year cuts is approved later this winter. To balance next year’s budget, the governor outlined nearly $63 million in spending cuts, including $22 million from the massive Agency of Human Services — $6 million of which would come from a home-heating assistance program. Throughout state government, he would eliminate 72 jobs, but add another 61 — and find another $5 million in unspecified labor savings. Shumlin also called for $20 million in new revenue to balance the budget, nearly $16 million of which would be raised by scrapping a tax deduction filers can take from their last state tax bill. Roughly 30 percent of taxpayers currently take advantage of the deduction, saving an average of $175. Most significantly, the governor proposed raising $41 million from businesses over five-and-a-half months by levying a new, 0.7 percent tax on their payrolls. Those funds would leverage another $44.5 million in federal dollars, he said, all of which would be dedicated to reducing the so-called Medicaid cost-shift and funding his other health care initiatives. Because the new payroll tax would be implemented in January 2016 — more than halfway through the fiscal year — the annualized tax increase could approach $90 million the following year, according to Shumlin’s chief health care adviser, Lawrence Miller. House members listen to Gov. Peter Shumlin's budget address. Shumlin’s fifth budget address came one week after he delivered an inaugural address that underwhelmed many observers, who said it failed to tackle Vermont’s most pressing problems. Instead, the governor focused last week almost entirely on energy and environmental proposals. But in this week’s speech, Shumlin turned his attention to the state’s fiscal picture — and his health care and education agenda. “Take your 5-Hour Energy drink,” outgoing Secretary of Administration Jeb Spaulding advised before the address began. Lawmakers and advocates had braced themselves in recent weeks for cuts made inevitable by more than $112 million worth of upward budgetary pressure. Finance Commissioner Jim Reardon said the administration had sought “a balanced approach” by spreading savings throughout state government. Taking the biggest hit was AHS, which oversees everything from health care reform to corrections to food stamps. The agency would lose $22 million in state funding next year, $6 million of which would come from the Low Income Home Energy Assistance Program and $1.7 million from reductions to Reach Up welfare benefits. Shumlin said he would spare the embattled Department for Children and Families’ child protection program and proposed increasing funding for drug treatment by 16 percent. House Speaker Shap Smith (D-Morristown) said his caucus might struggle with some of the cuts Shumlin proposed, including those to the home-heating program. But, he added, “We just may not be able to do as much as we did on LIHEAP." “I feared sort of an across-the-board approach, 5 percent in every department, which we've seen in the past, which is not wise,” he said. 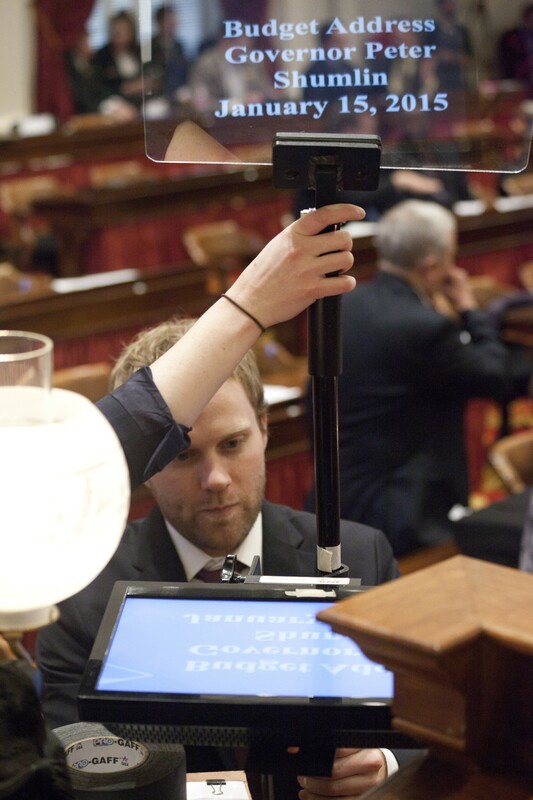 Shumlin spokesman Scott Coriell sets up the governor's teleprompter. Shumlin proposed another $22 million in reductions to other state government programs. Those include cuts to public safety call centers, the Community High School of Vermont, the current use program, Vermont Interactive Television, working lands grants and the state library. The governor said he would seek to negotiate $5 million in additional savings with the Vermont State Employees Association, an idea not immediately embraced by the union. “We think that’s an unfair tax just on state employees,” said VSEA executive director Steve Howard, who said his members would prefer a broader-based tax increase. Shumlin spent much of his address focusing on health care reform, an issue he said he’d spent “nearly two decades” studying. To that end, Shumlin pledged to redouble his efforts to contain costs and compensate providers for health outcomes, not individual procedures. He called for strengthening the regulatory Green Mountain Care Board and giving it oversight of a state information technology program. And he recommended devoting $55 million of the money raised from his proposed payroll tax to increasing Medicaid reimbursements, which he argued would slow growth in private premiums. 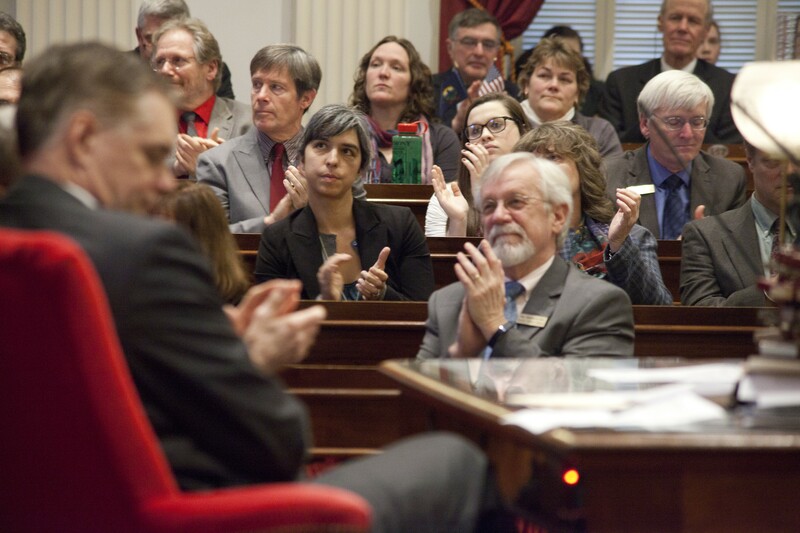 Reaction to Shumlin’s health care plan was mixed. But Lt. Gov. Phil Scott, a third-term Republican, said he worried the tax wouldn’t stay at 0.7 percent for long. While Shumlin proposed spending an additional $2 million to increase subsidies for low-income Vermonters who buy health insurance through the federally mandated exchange, Vermont Campaign for Health Security executive director Peter Sterling said that’s not enough to do the trick. “The governor’s proposal still leaves thousands of Vermonters exposed to deductibles, co-pays and out-of-pocket limits that make seeking medical care a potentially devastating financial experience,” he said. 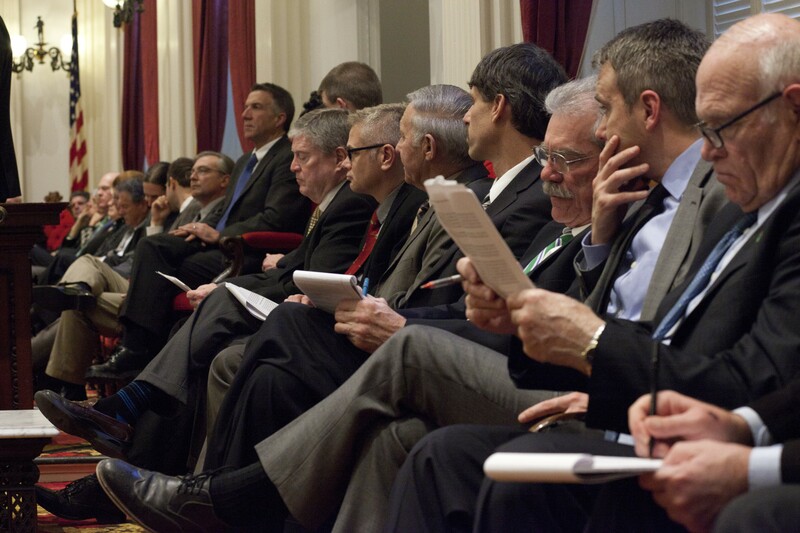 Vermont senators listen to Gov. Peter Shumlin's budget address. But at the same time, the governor cautioned against “precipitous changes that would fundamentally alter the way we deliver education in Vermont.” And he warned that lawmakers should tread lightly. Specifically, Shumlin said his Agency of Education would work with districts to identify savings — and, when they don’t cooperate, force the issue by closing schools. He proposed $3 million in construction aid to incentivize consolidation, an end to small-school grants and a “moratorium on new mandates from Montpelier." Shumlin also said he’d seek to ban teacher strikes and board-imposed contracts. The Vermont-National Education Association expressed hostility to the governor’s proposals on its Facebook page even before his speech was over. Smith, who has made reforming the state’s education finance system his top priority this session, expressed skepticism that Shumlin’s proposals would succeed in driving down costs. “The question is whether Vermonters see it as enough,” Smith said.